Now that everyone uses their mobile and tablet devices while on the go, most business owners are aware of how ranking in local search results can grow profits. Many businesses operate within a certain geographical area, and need targeted, local website traffic. Even for businesses selling products and virtual services without borders, local website traffic will have a higher conversion rate as people prefer to buy locally. So how can you make sure customers can find you in your surrounding area? Download the local SEO checklist, this blog post will guide you though each SEO tip as you climb the local search results! Recent local search updates where the “Local Pack” of map results went from 7 to 3 listings, and a timely survey of local SEO experts has created a wave of discussion in digital marketing and search engine optimisation circles. A few days ago Moz released their annual 2015 Local Search Ranking Factors. In the survey, top Local SEOs were invited to give their views on what it takes to rank in local search. 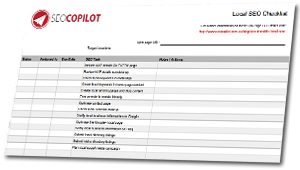 The recent search news prompted me to make this second update to the local SEO checklist, adding 5 new local search ranking factors to the list first published in April 2013. So let’s get into the details of these local search factors. These local ranking factors include things that can be done on your website or ‘on-site’ to boost Local SEO. The name, address, and phone number (NAP details) of your business should listed as standard on each and every webpage of your site. Typically NAP details are in the header and footer of local business websites. Create local content and lots of it! This one is a bit of a no-brainer, but you’d be amazed at how many local businesses are missing a trick by not actually writing about where they are. When you are optimising for local search, place is the most important thing of all, and you need to include it throughout your content. The town, city, state, and any other vital location information should be included in your page titles, meta-descriptions, in your heading tags (such as H2 and H3), and also in the body of your content. As ever, avoid keyword stuffing, but make sure that your location is present in all the right places. Build more local content by blogging about local events, include links to local attractions, services and amenities. 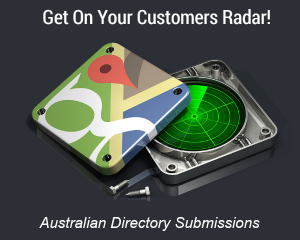 Create local landing pages targeting search results for your main services in surrounding suburbs. Make local content part of your content marketing strategy! More than ever, having a responsive design is imperative for Local SEO success. Google are well aware that people are increasingly using mobile devices, especially for local searches. To provide mobile users with a better experience they added mobile friendly design into their ranking algorithm. You need to ensure that your website looks its best and is easy to navigate on all of these devices, and a responsive design ensures just that. Not only is this important from a user experience perspective, but Google will not look favourably upon on sites without responsive design and they could struggle with mobile search results. 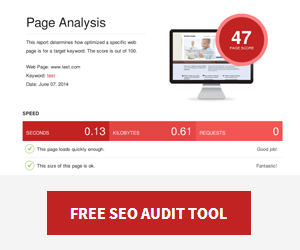 Google created a tool to help, which checks your website is mobile friendly. Schema Markup is a standard code that tells search engines about the structure of information. It’s essentially a selection of tags to mark different content, from phone numbers to opening hours. Google often uses the Schema Markup to return more informative results for users. The Local SEO Yoast plugin was built to simplify adding schema markup to WordPress websites. Click-through rate has always been considered an important SEO metric, however recent studies (like Searchmetrics SEO Rank Correlations And Ranking Factors 2014) concluded that higher positions in search engine results correlate with higher click-through rates. Your meta title and description are displayed in search results, so optimise them for click-through by weaving a call to action with your keywords. If you have ever searched for something locally in your area, you will have probably noticed that often Google displays a map with local businesses highlighted. To appear in this “local pack” section of the search results you’ll need to create a “Google My Business” page, or claim one if it already exists. To verify your address Google will mail a postcard to you with a your verification code. Get started at the Google My Business Help Center. Asking local clients to leave testimonials. Verify your business with Bing. And you’ve guessed it, you need to do exactly the same thing again with Bing to ensure that you are covering all search bases. Although bing has a much smaller piece of the search engine market, they recently forecast taking market share from Google, with a Bing search bar part of the new Microsoft Windows 10 desktop. Verify your local business with Yahoo! Google isn’t the only important search engine out there, and you can also verify your status as a local business with Yahoo! The process for this is also to request a postcard that includes a pin you will need to verify. Submitting listings on local directories is also a great way of ensuring that people can find you. It also builds local authority by having multiple citations of your NAP details. Since the best local business directories review submissions and do their own verification, listings build local authority with multiple citations of your NAP details. Include detailed (and consistent) information about your website, your business, address and contact details. Where possible, add content including photos and videos to build the profile of your listings. Don’t forget niche directories. If you have a website that promotes your hotel, for example, you should undoubtedly be listed on Tripadvisor. And if you have a local restaurant that you wish to advertise, make sure that you are on sites like Zomato, formerly known as Urbanspoon. Have you visited you local council and community websites? They may also list local businesses, and a great hyper-local signals for Google. If your business has moved offices or your restaurant has moved to a new location, it’s imperative that you update your location and contact details across your website, your social media, and any directories and listings pages that you are present on. Inconsistency will confuse both search engines and people who want to find information about your business. Make sure your name, address, and phone number (NAP details) are consistent across the web. Reviews on diverse websites are a local search factor (and also convince more people to buy from you!). So write an email template you can customise asking clients and customers to leave reviews on your Google business page & top directory listings. Most businesses use social media these days, but are you targeting your geographic area? Find and follow people and businesses in your local area on social media, and include your address or suburb in profiles. Don’t sell, build your local reach and social network by sharing more local content from local people and businesses. Want more local customers? 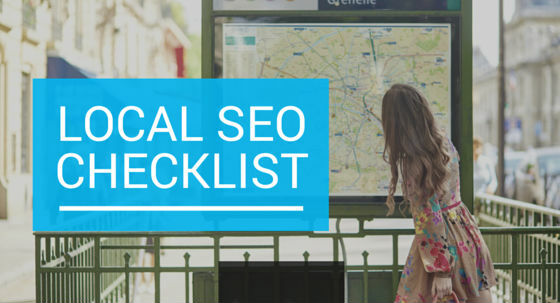 Download the local SEO Checklist and transform your local search exposure! Great Tips and Advice, thanks Chris. Just one (unproven) tip I would like to recommend. Have the local business website hosted in the County and closest City that the business is located in. Thanks Chook, good advice. If nothing else hosting locally should improve your website speed which is a ranking factor and great for visitors.